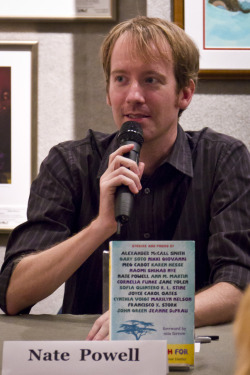 Award-winning graphic novelist Nate Powell (Swallow Me Whole, Any Empire) was among a panel of 9 Young Adult authors that appeared before the United Nations to raise funds and awareness for young refugees of Darfur last week. They spoke about their contributions to a new book called What You Wish For, aimed at bringing hope to a troubled region. Following their UN presentation, they appeared at a book signing at the New York City book store Books of Wonder. The short story anthology What You Wish For includes a comics contribution by Powell, as well as stories by YA authors such as R.L. Stine (Goosebumps), Ann M. Martin (The Baby-Sitters Club), Meg Cabot (The Princess Diaries), poets like Nikki Giovanni, Gary Soto, Naomi Shihab Nye, and others, totaling 18 contributors. The book also includes a foreword by actress Mia Farrow, who serves as a Darfur advocate and UNICEF Goodwill Ambassador. The book was published by the all-volunteer non-profit organization Book Wish Foundation, with 100% of proceeds from the book’s sales going to UN Refugee Agency UNHCR. The agency will use those funds to build libraries for refugee camps in Chad, which is populated by hundreds of thousands fleeing from horrific violence in neighboring Darfur. Nate Powell is the only person from the world of comics involved in the book. His story is called “Conjurers”. Powell’s graphic novels have been highly praised for good reason. Swallow Me Whole is a haunting exploration of teenage turmoil amid mental illness. It was selected as a Los Angeles Times Book Prize finalist in the Young Adult category (before there was a graphic novel category), and was named on YALSA’s Great Graphic Novels for Teens list by the American Library Association. It also won Ignatz Awards for Outstanding Debut and Outstanding Artist, and the Eisner Award for Best Original Graphic Novel. You can watch the entire 2-hour UN panel presentation.